How Do You Protect Trees And Your River? What are the best ways to protect our forests, our trees, oysters, our water quality? State Senator Sarah Elfreth (D. District 30) and Arborist Tyler Balderson, with Bartlett Tree Experts, offered two crucial ways do this: legislative and practical hands-on solutions. 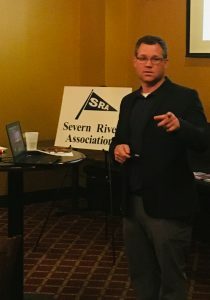 Both approaches were described during the John Wright Educational Series meeting sponsored by the Severn River Association last month. 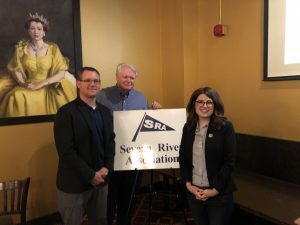 State Senator Sarah Elfreth (D. District 30) was on hand to provide updates on critical legislation that was pending before the Maryland Legislature. And, there there are two victories to celebrate for forest protection. The legislature approved measures to study forest loss in Maryland (SB-729/HB-735) and to tighten mitigation rules by tightening the forest fee-in-lieu mitigation requirements (SB-234/HB-272). The Senate and House of Delegates also approved another measure Sen. Elfreth supported require Maryland counties to be more transparent publicizing environmental enforcement efforts (SB-505/HB-703). These measures are awaiting Gov. Larry Hogan’s signature. While it’s back to the drawing board to on the no net loss provision, there’s still plenty property owners can do to protect their own trees. Balderson started his presentation with a quiz: When’s the best time to plant a tree? When’s the best time to trim your trees? In the fall? In the Spring? During the winter? It turns out that the best time to plant and trim a tree is not related to a season. Instead, Balderson, a Board Certified Master Arborist MD with Barlett, says the best time to trim and plant is “whenever you have the budget,” and the sooner you get started, the sooner you’ll have that 200-year-old tree! When’s the best time to take down a healthy tree? Almost never, in Balderson’s opinion. Trees provide far more value to property, including protection from erosion, than people realize. He never thinks it’s a good idea to remove a tree just to enhance a view, especially in the critical area and buffer zones. The goal of any trimming should be to enhance the health of a tree. Unnecessary tree removals create expensive erosion problems that homeowners could easily avoid with a professional pruning service. Well, what about taking down dead trees? When comes to dead trees, relax and save your money. Balderson says dead trees are rarely at risk of falling over due to storms. Reason: Without any leaves on those dead branches, the wind just blows through the branches. 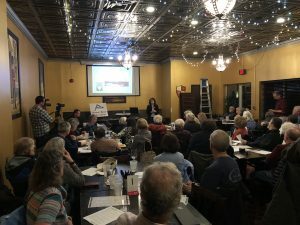 It’s the live trees, with their thick canopy of leaves, that are the fall risk, he told attendees March 20 during the John Wright Educational Series presentation at Union Jack’s of Annapolis. The problem with live trees, Balderson explained, is that the leaves act as sails and catch the wind during a storm. That’s what causes live trees to fall over. Without those “sails,” dead trees have survived a tornado and remained standing while live trees succumbed to the winds. Balderson also points out that dead trees can be a positive attribute to your property because they provide habitat for wildlife, especially woodpeckers. So, if you admire birds, make them welcome, leave that dead tree alone, except in cases where an arborist advises otherwise. As with children, who need nurturing from birth, through school, and through college, trees also need nurturing. There are proper ways to trim trees to ensure that you don’t inflict serious harm during the process. Balderson advises property owners to create vegetative management plans and to always obtain permits, especially when working in the critical area. Permits are not onerous exercises, he explained. Instead, permits actually help homeowners avoid doing “stupid things” that harm their trees and property values. SRA has produced videos of the March 20 presentations by Sen. Elfreth and Tyler Balderson. Click here to watch Sen. Elfreth. Click here to review Tyler’s presentation on trimming trees.